Leaked Samsung Document Details KitKat Update Plans; Galaxy S3 GT-I9300 KitKat Update "Canceled For Now"
Back in November of last year, we shared an internal Samsung memo showing the projected KitKat upgrade timetables for several of Samsung’s recent devices. The previous leak stated that the Galaxy S4 and Note 3 would receive the update in January, while the Galaxy S3 and Note 2 would receive theirs some time between March and April. 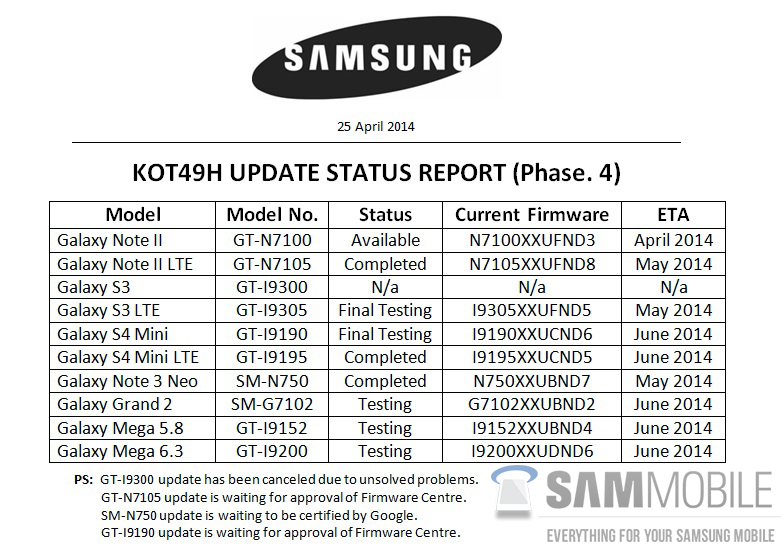 Unfortunately, April has come and gone, and the Galaxy S III GT-I9300 is still without its official KitKat update. Now, thanks to a new leaked document originally posted by the folks over at Sammobile, a little more light has been shed on the matter. So what’s responsible for this? The problems could be due to a number of factors, but the most plausible explanation is that the device’s 1 GB of RAM makes it incapable of bearing the full load of current generation TouchWiz bloatware. This is further solidified by the leak stating that the Galaxy S3 LTE (which comes with 2 GB of RAM) will receive KitKat soon.